Patiently & stealthily we have now built up the Holy Grail hat-trick for Reed. Battle-hardened veterans of this site will recall with misty eyes, their Health division’s travel mug and their sumptuous Marrow posing the question: “Are You Better Off Working?”. Only the handle’s front elevation features any type of detail. 1/ In a hint of creative genius, the printers exercised their European ruling of ‘The Right To White Space’. 2/ The printers forgot about the side-aspects leaving only up front & centre. 3/ Reed had a very limited print budget and left it at the mercy of the printers, where any of the above 2 combinations could’ve applied. 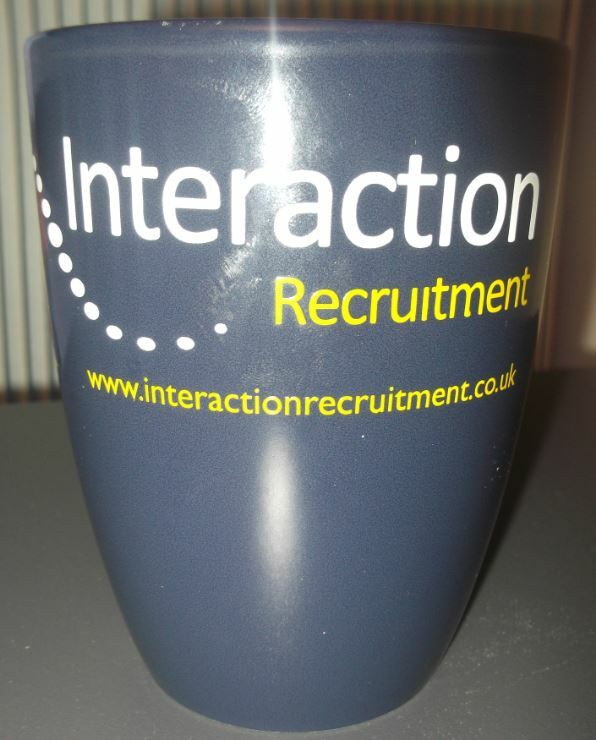 So as we have it, if a user holds the mug in a ‘live’ beverage environment, depending on whether they are left or right-handed, only fools & jokers at your respective sides will get the Reed message. Thanks be to our to our roving Spotter covering South Manchester & the Peak District, who bravely snapped this intriguing but ultimately obscured Atlantic whilst on their travels. On location in its natural kitchenette habitat, it looks unloved and some japester (or downright lazy article) seems to have stuffed a disused St*rbucks Sheath in it’s aperture for comic effect. It’s not abuse on the scale of some of our previous mugspots but it certainly needs a de-sheath and thorough valet before normal beverage consumption can be partaken again. 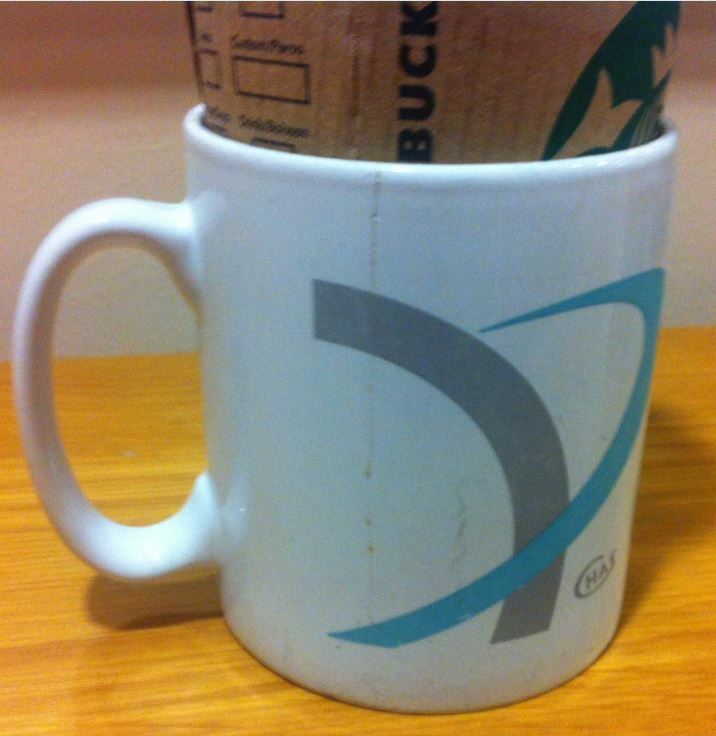 Somewhere under the cardboard and tea-stains is a very credible mug waiting to get out. Which might I add, sounds refreshingly honest! Plus, any mention of the word HOT brings out mixed emotions for us in the UK as this signifies weather we just never get to enjoy anymore but it’s also a great excuse to revisit the 1982 calypso-tinged magnum opus, HOT HOT HOT by Arrow. Whatever your taste in music there’s no denying that if you click this link you won’t spend the rest of the day mouthing this tune! On the subject of a hot one, mine’s tea, 2 sugars…. 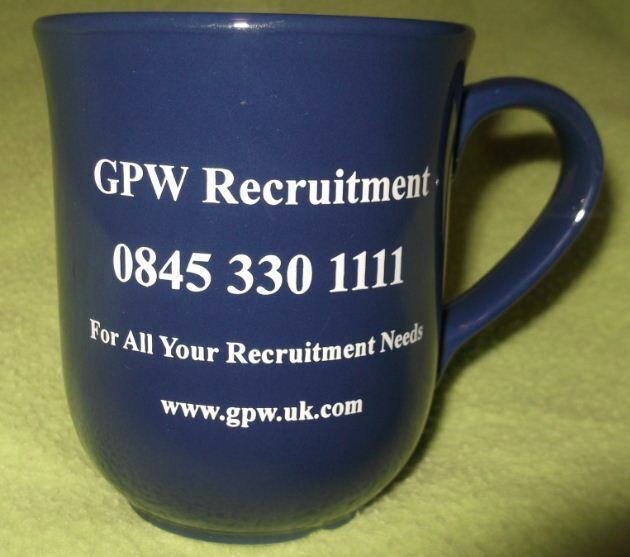 At the risk of repeating myself, the Recruitment Industry must keep Trade Mug manufacturers in business. 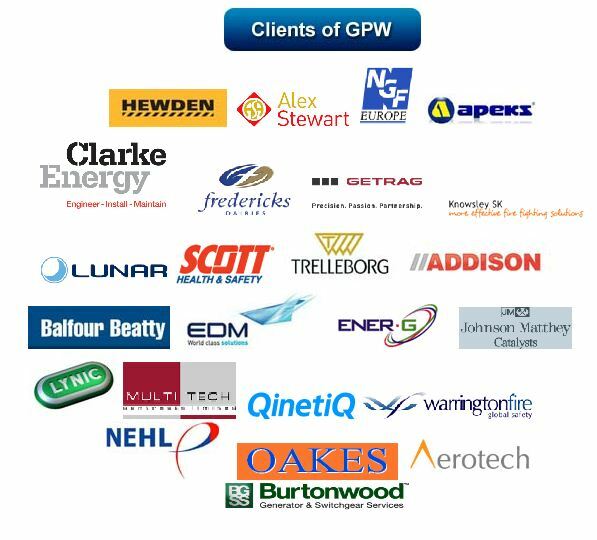 Heaven knows we’ve got loads on this blog but it has to be said I’m finding it hard to love this ‘Bell’ from GPW Recruitment. It’s about as dour as they come. There’s not even a logo in sight! It’s 20 pt Times Roman Bold all the way on a sober dark blue background. It’s all the more distressing as the signage on their website looks like it would work nicely when transplanted on a clean white mug elevation. No your eyes do not deceive you. Nor will we be likened to the BBC by keep on filling our blogdule with repeat spottage! 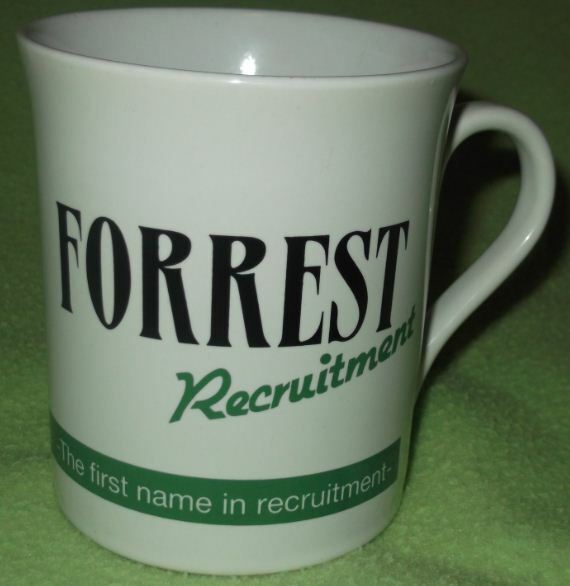 Yes, we have been here before in recent times celebrating Forrests Silver anniversary mug but that flawed Racing Green number hasn’t got a patch on this much cleaner 2 colour-on-white variant. It’s almost a ‘lift & shift’ from it’s sister vessel but this looks more like a strain of Newbury, as opposed to the earlier Atlantic. The strap is white reversed out of the green slug running across it base and the branch list makes for a clear & gripping read. This is altogether much more pleasing to the eye and a lot more legible all round. 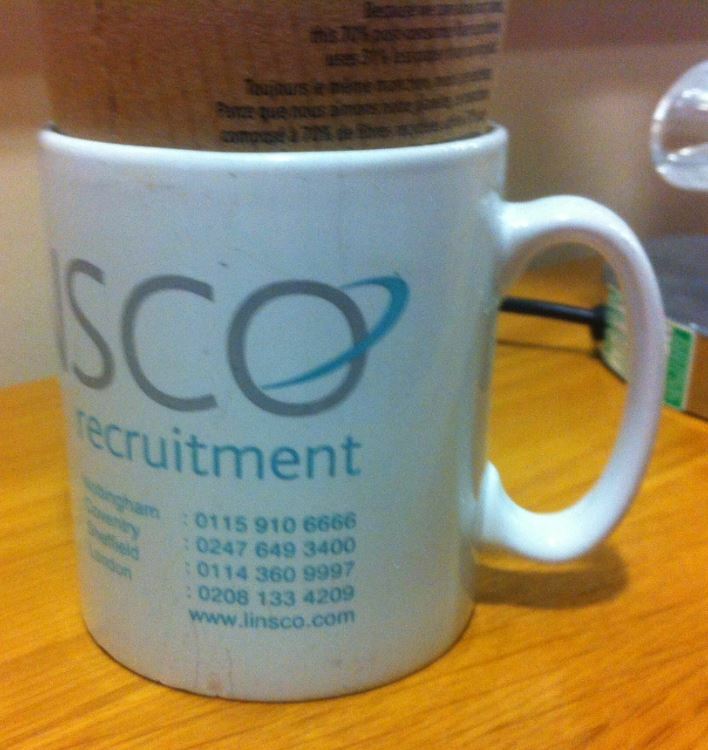 I make no apologies for this post and I think provides a wonderful opportunity to compare and contrast the 2 mugs. Which is best?….In my mind there’s only one winner. Everytime I hear Randstad, I can’t help thinking of Grandstand, which back in the Seventies & Eighties was the ‘Must-see’ Saturday afternoon sport programme: The iconic theme tune; Frank Bough; Rugby from Cardiff Arms Park; Eddie Waring; Final Score; The VidiPrinter; Keegan scoring ‘that’ header in the end credits….ahhh set adrift on memory bliss. Snapping back to reality though Randstad are yet another recruitment giant joining our Hall Of Fame. 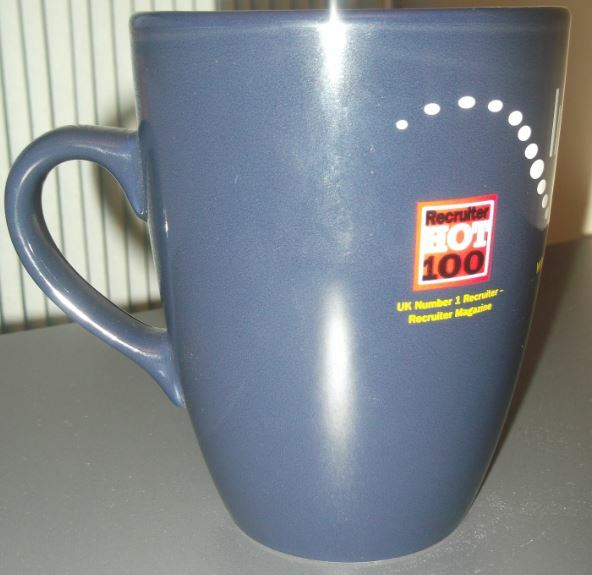 In truth, it’s a lovely mug both in terms of design & print. It’s a slim-line Deco (quite rare these days), tri-colour on white. Refined, sleek and elegant. The logo is understated in powder blue a la Carpenters. And that’s the beauty of Trade Mugs. Many of you browsing this site will have them at home but you may not even know it. Any donations & contributions are always gratefully accepted. Please get in touch by leaving a comment. 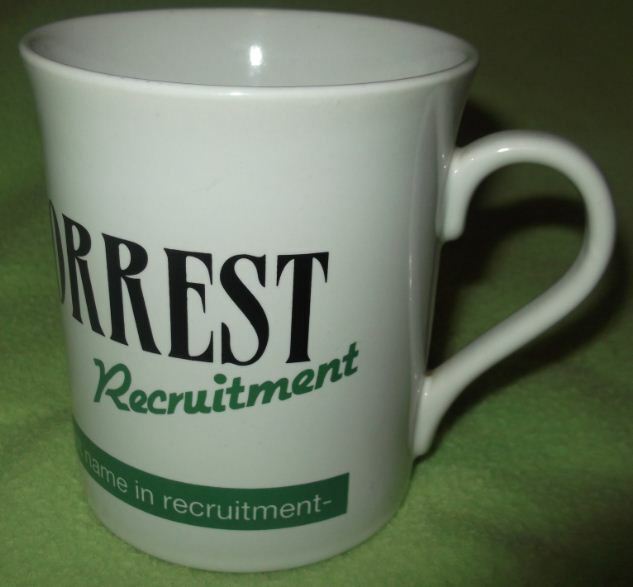 Mugspotters sees its first ‘Racing Green’ entry in the shape of this Atlantic courtesy of Forrest Recruitment. 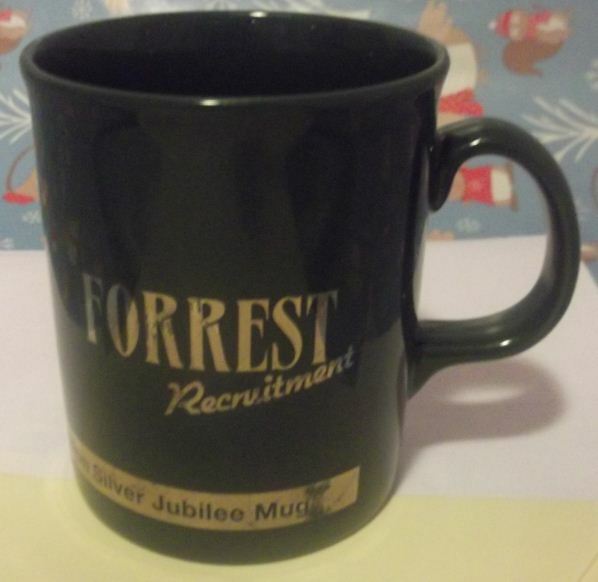 Why Gold type has been chosen to promote their Silver Anniversary is an odd choice but this ‘Limited Edition’ jubilee mug manages to pull off the trick of looking really old despite it only being produced in 2010. 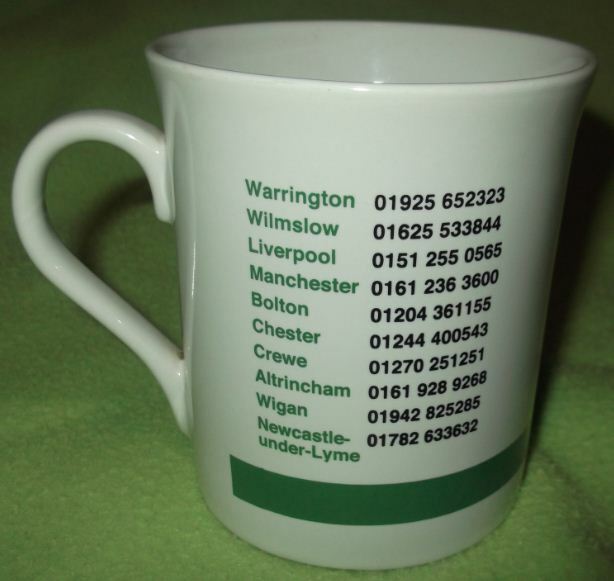 The rear elevation shows a list of Forrest’s North West based offices, which is always good to see on a mug. Time has not been kind and sadly some of the intricate printwork has already started to dissipate leaving users with a rare case of what we Spotters call ‘Goldfinger’.